Returning to the ECA cycle, we’re now ready for an interesting realization. In making our career decisions, one key question we all face is when and to what degree we should focus on our passions, the things we like, and when and to what degree on our masteries, the things we’ve been good at so far in life. In the language of this chapter, our passions can be called our emotional skills and traits and current experiences, and our masteries our cognitive skills and traits and accumulated experience. We can think of passions and masteries as Systems 1 and 2 in the context of our life’s experiences. At different times in human history we’ve flipped back and forth between these two prime movers of our behavior. For millennia, we usually did what we were told, and often, what our parents did. Deviations from the expected course would typically lead to privation, ostracism, or worse. Cognitive factors (what was expected of us) and historical actions (what we’ve always done) were dominant. But whenever boom times emerged, with their influx of wealth, relaxation of social mores, and new personal options, we’ve seen passions and life experiments take the front seat, at least temporarily. In America, our Puritan religious traditions in the 17th-18th centuries were perhaps the deepest set of cultural cognitive expectations for our life choices. Narrow forms of mastery, and values like character, thrift, moral purity, and social cohesion dominated our career thinking. The rise of cities, industrialism, the opening the frontier, wars, and other social disruptions allowed some to escape cultural expectations and try out passion-driven career experiments. But for most people, until recently, such options weren’t available. In the early to mid 20th century, the rise of the mass consumption society and the emergence of the American dream became our new set of secular cognitive expectations, idealizing the nuclear family and the organization man in a world of growing affluence. As Brink Lindsay chronicles in The Age of Abundance (2008) an unprededented transition to mass social affluence after World War II permanently changed our values and dominant politics, shifting more of us to the pursuit of passions, at least with respect to our hobbies, if not our careers, than ever before. Passion finally became a dominant career litany for many (most?) middle class affluent youth just after the Civil Rights Movement and Counterculture Revolution of the 1960s. It looked as if we’d reached a new promised land, where we had the wealth and freedom to do what we liked. Yet at the same time a vast and predictable growth in US plutocracy began to harness that wealth, and in the decades since we’ve seen an erosion of the social contract and the career, education, and entrepreneurship options and support available to young graduates. The passion first litany became a cultural concept with the 1970 publication of Richard Bolles’ What Color is Your Parachute?, still the world’s most popular job-hunting guide. This is a playful and often insightful book, but its central premise of finding and following your passions as the surest way to success and happiness is the wrong advice for our time. It might work in an abundant, post-singularity future, but even there it would probably not be the best path for most of us. But in our current era of flat or declining individual wealth and career options due to plutocracy and technological unemployment, a competitive world where the cognitive and social costs of reinventing our careers is very high, mastery, not passion, is by far the best strategy for building our careers. 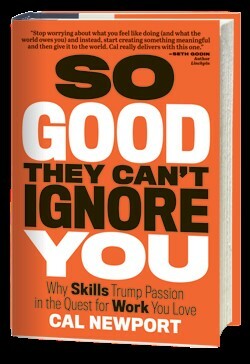 A book that elegantly makes this point is Cal Newport’s So Good They Can’t Ignore You: Why Skills Trump Passion in the Quest for Work You Love (2012). Newport shows that instead of pursuing our passions as a way to mastery, it is usually a better strategy to do the reverse, and build our skills, step by step, to increase our options. When good jobs are hard to find, which is almost all the time in economic history, you want to first figure out your existing cognitive strengths and skills, whether you are presently passionate about them or not, then build your first masteries around those strengths. Once you’ve had success with those, you start building career capital, and can use that capital to make little bets on things that may get you closer to your true passions, which won’t be clear at first. For all but a few of us, the things you find emotionally interesting in life are very likely to change as you become expert at something, and some of your interests will deepen into passions and others will fade away. Those passions that survive our high school years and remain into mature adulthood, even when we cannot yet do them as much as we like, are the ones that truly deserve our attention later. We might call the rest “prepassions”, imaginations that haven’t been tested against reality. Most of those won’t stay around for very long. If you want a great example of how poorly we typically know and regulate our own passions, and set and keep cognitive priorities when we get a sudden increases in options, look at those who get large unexpected windfalls, including lottery winners and inheritors. Many use that money to chase things that they thought were passions, only to find that they are unfulfilling. If our passions don’t lead to masteries that provide social value, things that help others, they don’t make us happy. Many also are unable to control their own urges, or their new money. The National Endowment for Financial Education says as many as 70% of Americans who get sudden windfalls lose all their financial gain within several years afterward. When we focus on skill building, it is also important to be strategic. Igor Kokcharov’s concept of a hierarchy of skills (picture right) gives us an idea of the real options that higher skills open up to us. 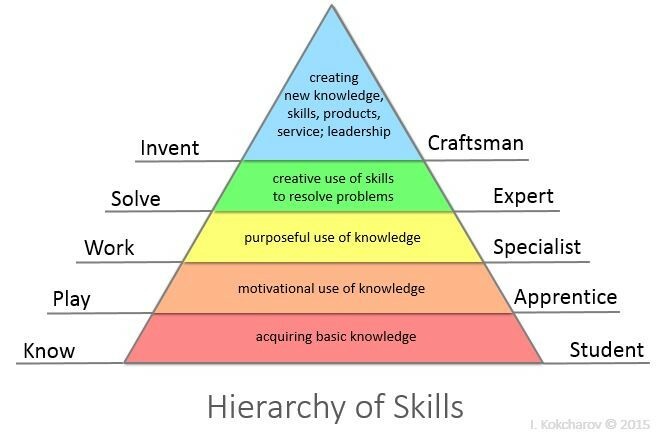 The transition from student to craftsperson is something we all make in our lives, in various domains, or fail to make if we remain overly enamored with learning and passions and not enough with mastery, or learning applied to real problems. We can think of Kokcharov’s pyramid as the edge of our T-shaped (or Star-shaped) personalities. The higher we go up the pyramid, the sharper our cutting blade becomes, and the more useful and in-demand our skills. The sooner we are craftspeople, the sooner we are creating the highest social value we can with our knowledge, building social and entrepreneurship capital. Newport also discusses the importance of deliberate, intense practice, with quick expert feedback as the fastest way to climb the hierarchy of skills. We also need to think very seriously about the “adjacent possible”, what skills make most sense for us to acquire next, at every point of our climb up the pyramid. Once you’re a master of something, paid a reasonable wage (not necessarily rich) at what you do, you’ll be in the best place, financially and experientially, to ask which of your passions are still not being met by your current job, and then figuring out how to meet those passions by paying for experiences, picking up hobbies, becoming a manager/delegator in your current work, gaining mastery in a new skill, or if necessary, changing your job or life goals. Along the way you will need to continually resist the trap of being given more of the kind of work you don’t want, and instead, trade in some of your career capital for more freedom to do the kind of work you think you will love, even when it pays less. After some successes with that, you can then begin to ask what your life’s mission, your greatest passion and legacy might be. That might be a time to make some bold moves, but only once you’ve got a lot of capital, fallbacks, and a safety net in case your exciting venture doesn’t pan out. If instead you plunge into your career passion first, or even worse, drop out of a well-paying high skills job to pursue a “passion” you have no serious mastery in, you won’t be able to do anything “remarkable enough to be sharable,” and won’t to get paid well or appreciated widely for what you do. You may look up ten years later and realize you’ve wasted your prime years on the wrong strategy. So while the current media litany remains “follow your passions”, the experienced reality, after fifty years of decaying social contract and growing plutocracy is “be happy you have a job, for tomorrow it may be gone.” The pendulum will eventually swing back to boom times again, as technical productivity continues to accelerate, but for now, the cost of reinventing yourself two or three times mid-career is often quite high, and the passion litany has become one of our most public traps.